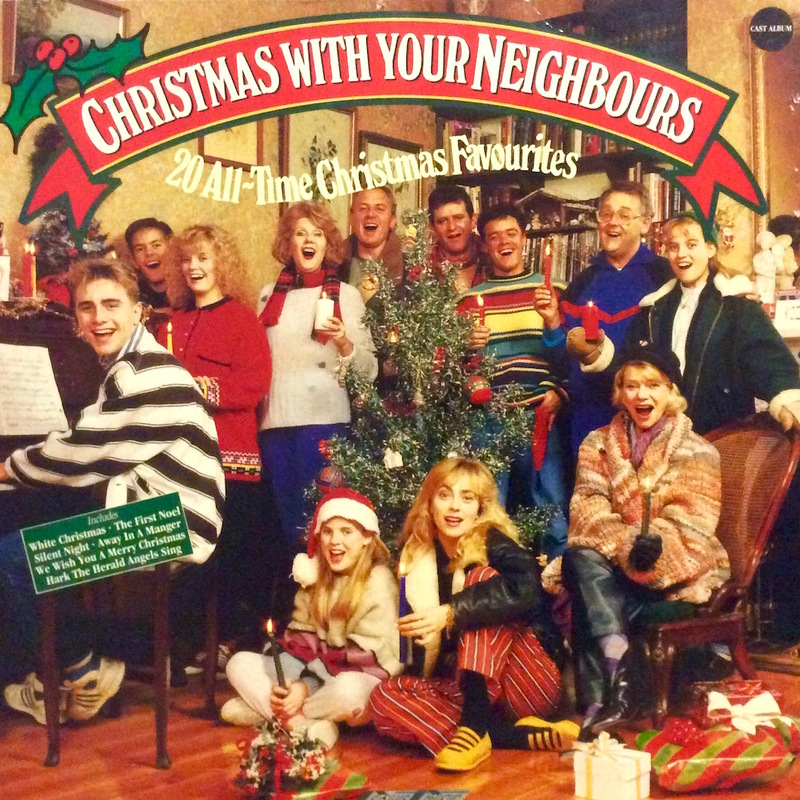 Today’s Pop Rescue from a fate unknown, is the 1989 Christmas With Your Neighbours LP by the cast of Australian hit TV soap Neighbours. This 21 track Christmas album opens with the song Good King Wenceslas sung by the cast. The keyboards are deep and even, just like the snow, but musically this is quite a simple almost church-sounding version. It seamlessly merges into Hark The Herald Angels Sings (I’d have altered this to Hark The Harold… but who am I to complain) again by the cast, and again straight into the classic We Wish You A Merry Christmas. Next up is The Twelve Days Of Christmas. Again, musically it has that air of singing along to a cheap cassette but the cast belt their way through this long-winded song. Someone is plonky on the keyboard. The cast members are so far indistinguishable, apart from what can only be Ian Smith (Harold Bishop) holding a big bass note. Having made it through that, we’re now on to Away In A Manger, sung by Mark Stevens (Nick Page) and Annie Jones (Jane Harris), with backing from the cast. There’s an almost wannabe Jason Donovan sound in Mark’s vocals, and he puts in a reasonable performance. Annie’s contribution is subtle. Sally Jensen (Katie Landers), Anne Haddy (Helen Daniels) and Kristian Schmid (Todd Landers) tackle Rudolph The Red Nosed Reindeer. This is a really bouncy version and Sally’s childish voice really helps. The rest of the cast help the song along, even allowing for the ‘like a lightbulb’ line to add a little playfulness to this fun little song. I Saw Three Ships follow this, sung by the whole cast. As far as Christmas songs go, this one has always has been a pretty dull one in my opinion. The cast carry it off though with little effort. Stefan Dennis (Paul Robinson, and the only remaining current-day cast member) is joined by Mark Stevens for this really quite good sounding God Rest Ye Merry Gentlemen. The rest of the cast help to add a chorus to what is actually the best track so far, and it even builds up towards the end. O Come All Ye Faithful follows this, with some deep organ recital, allowing Ian Smith to show off his deep voice. The cast join him for the chorus, but the song is truly his. Stefan takes the lead on the heavenly song Silent Night, although he (dare i say) clearly struggles a little. Mark joins him, although his voice is only evident from the second verse. Musically, this one is reasonably good. Side One closes with the upbeat Santa Claus Is Coming To Town, with Sally taking the lead with the cast behind her. The interplay between male and female vocals works particularly well. Side Two opens with The First Noel, again sung by the cast, who really sound great here – and perfectly in line with each other. Ian again stands out a little, as does one of the female voices, but it’s unclear who. Sally’s saccharine vocals lead Frosty The Snowman, again joined by Anne and Kristian, and backed up by the cast. Anne and Kristian are a mystery here, as they can’t be picked out from the rest of the vocals. This merges seamlessly into Jingle Bells. The cast take Ding Dong Merrily On High, with their chorus approach making a substantially better job of the song than the keyboard player does. Joy To The World follows this, again with the cast taking the song with great ease. The male chorus parts really shine here, but whilst the organ is fairly church-like (and that’s good here) it is done with great speed and that kind of ruins it a bit. The Little Drummer Boy follows with Stefan, Mark, Jessica Muschamp (Sharon Davies), Ian and the rest of the cast in backing. Thankfully the drums and keyboard bell sounds used here do the song justice alongside the vocals. White Christmas is up next, with Alan Dale (Jim Robinson) taking a brave solo of this classic song. To be fair, he does a fairly credible version, although he doesn’t dare tackle the high note, leaving that to a mystery female voice instead. Deck The Halls bursts in, again with Ian leading the voices as some cheap speed keyboard trumpets play. The cast race through this traditional song as it builds up. It abruptly ends as fast as it started. Penultimate track, While Shepherds Watched sees Stefan, Annie, and Mark take the lead, with the rest of the cast adding some gentle backing vocals. The song builds nicely, with layers of keyboards and eventually a much more bassy sound taking it to the conclusion. The Holly And The Ivy plays in the background as Anne Charleston (Madge Ramsey/Mitchell/Bishop) leads the final track Intro. Spoken Christmas Caring. This sounds like an original song, as it’s far more upbeat than the rest and takes many opportunities to mention neighbours, family, people across the street, and sharing. There’s some spectacular 80s electric guitar as Mark, Stefan, Annie, and Jessica take the vocals. Over all, throughout this album, you can just about hear the Neighbour’s marketing team rubbing their hands together in the background. I’m unsure whether the cast wanted to do the album, or whether it was decided for them in this post-Kylie Minogue and Jason Donovan, and pre-Delta Goodrem time. Stefan Dennis is the only one here noted as having a record contract, following his hit Don’t It Make You Feel Good, although Ian Smith and Anne Charleston had released their single Old Fashioned Christmas in the same year as this album (although it didn’t chart in the UK). This is a pretty fast romp through the classic songs, and generally oozes festive spirit, but aside from God Rest Ye Merry Gentlemen and The Little Drummer Boy, you’ll be pushed to find one you’d want to play twice. Where are The Neighbours now? Neighbours shifted from the BBC to Channel 5 in the UK in 2008, and recently celebrated it’s 30th anniversary. Of the cast members on this album, only Stefan Dennis remains in the show (as Paul Robinson). Anne Charleston (Madge Bishop) and Ian Smith (Harold Bishop) have returned at least twice since their original departure – both for the 30th anniversary. Actress Anne Haddy‘s character Helen Daniels died on screen in 1997. Anne herself was seriously ill, and sadly died in 1999. 1989 UK CHART PEAK: Did not chart. POP RESCUE COST: £14.50 from an eBay seller. Posted in 1980s, Christmas, NeighboursTagged 1989, Alan Dale, album, Anne Charleston, Anne Haddy, Annie Jones, Bronwyn Davies, Christmas With Your Neighbours, Des Clarke, Harold Bishop, Helen Daniels, Ian Smith, Jane Harris, Jessica Muschamp, Jim Robinson, Katie Landers, Kristian Schmid, Madge Bishop, Mark Stevens, Neighbours TV Show, Paul Keane, Paul Robinson, Rachel Friend, review, Sally Jensen, Sharon Davies, Stefan Dennis, Todd Landers, xmasBookmark the permalink.